The RSC productions of Hilary Mantel’s Wolf Hall and Bring Up the Bodies are heading to the West End and tickets are selling so fast that an extension is being considered. Director Jeremy Herrin’s productions of Mike Poulton’s dramatisations have met with universal critical and public acclaim. Hilary Mantel’s novels about Cromwell’s life in the Tudor court have captured the public’s imagination, becoming international best sellers. The books have sold a staggering 1.8 million copies in the UK and 1.2 million copies in the US. 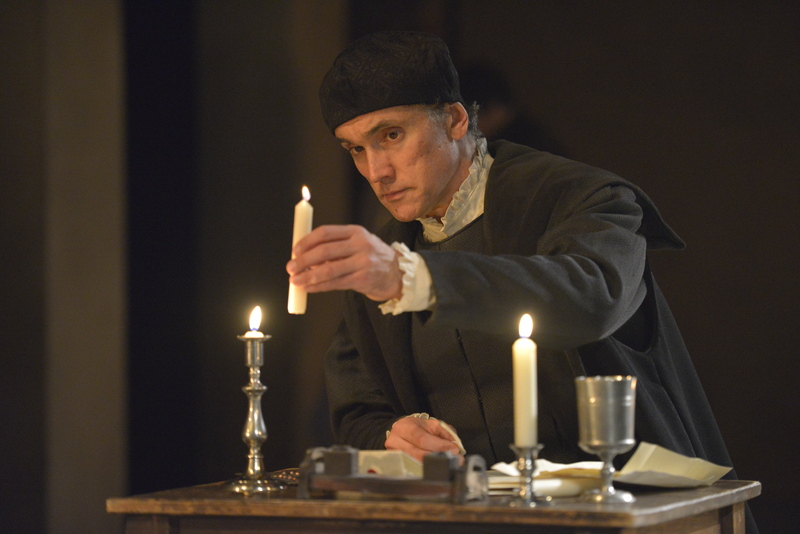 Many of the RSC company will transfer to the West End including Ben Miles as Cromwell, Nathaniel Parker as Henry VIII, Lydia Leonard as Anne Boleyn, Paul Jesson as Cardinal Wolsey and Lucy Briers as Katherine of Aragon. The open at the Aldwych Theatre from May 1. Hilary Mantel’s enormously popular books have been adapted for the first time for the stage in two parts by Mike Poulton. The adaptations were commissioned by Playful Productions who worked in collaboration with the RSC to bring them to the stage. The two plays tell the compelling story of the political rise to power of Thomas Cromwell from blacksmith’s boy to Henry VIII’s right hand man, and have been playing in repertoire since December. Said Mantel: “I am, I think, currently the luckiest author in the world. When my novel Wolf Hall was published in 2009, it was awarded a Man Booker prize and brought me a legion of keen readers worldwide. “Its sequel, Bring Up the Bodies, won a second Man Booker and the Costa prize. Could life get better? “It could. Brilliantly adapted for the stage by Mike Poulton, my Tudor tales are enjoying a spectacular run in Stratford-upon-Avon. “Each night, at the Swan Theatre, we have the privilege of setting our funny, fast, harrowing plays before audiences who are provoked, exhilarated and moved. “Jeremy Herrin directs a clever, committed cast, headed by Ben Miles as the sardonic and constantly surprising Thomas Cromwell. “In their glowing costumes, against a stark background, lapped by flames and falling snow, our company recreates the court of Henry VIII, its brief love affairs and brutal power games, its dances and masques, weddings and executions. “To walk into a theatre where every seat is taken is a special experience. Now we have the chance to bring the plays to a wider audience. “We are thrilled that our London base is to be the Aldwych, once the home of the RSC, a theatre that will provide a showcase for this unique project. “We hope to delight our London audiences this spring as we have delighted our Stratford audiences through the winter. Mike Poulton said: “Hilary and I have been at work on Wolf Hall and Bring Up the Bodies for over three years and we’re still at it. “It has been an extremely happy and close collaboration. We’re constantly asked if there have been difficulties – tensions – in our working relationship and we’ve become almost apologetic in having to confess that there have been none. Absolutely none. Jeremy Herrin said: “I’m delighted to be working with this great ensemble to deliver these entertaining adaptations of Hilary’s phenomenal novels to a new audience in a new space.